Well that's 2 minutes and 40 seconds of my life I will never get back. Jand as I asked if you are so worried and you are in Canaries why not come home?? 1. Said that El Hierro was being evacuated when only a village on the island was affected. 2. Says that many scientists he has been in contact with have given him alarming information and informed him that he and his family should be at a high level (presumably to escape tsunamis). I have a good mind to inform these scientist of his postings and what he has said in their name - I'm guessing they will be surprised and may wish to complain to admin. 3. Has suggested (from his own non expert readings of tremor charts) that other islands may be facing an eruption. I have no idea why he is "bigging" up this story. It is interesting and deserves to be looked at but his alarmist lies are just despicable. Oh yeah - jand says that "thousands of lives are at stake" because of the wrong type of ship being sent over. Will a camera photographing underwater eruptions really save thousands of lives? You really need to get your facts right and I do not lie !!!! to say that El Hierro had been evacuated which I posted . I suggest that you contact both of the above yourself and maybe ask them also about the two latest earthquakes near Gran Canaria. Your quote Oh yeah - jand says that "thousands of lives are at stake" because of the wrong type of ship being sent over. Will a camera photographing underwater eruptions really save thousands of lives? I think that is disgusting that thousands of lives COULD be at stake and they are stopping the ship comimg with equipment that could save them. I await your apology and wish a retraction by yourself on the above statement. it even says that in the article you linked to! La Restinga is on code RED the rest of Island is on Yellow. Please can you have a look at the link below and let me know what exactly is happening at El Hierro and is an erruption going to happen. I am at the moment on Fuerteventura and are very worried about what is happening. Could we expect a Tsunami if this erruption is big and should all the Canary Islands now be on some form of Alert. I can understand your concern, as I have asked previous posts if you are so worried why not come back to UK until all possible threat is over? rather than face the outside chance that there is a disaster, get out now while there is no overall panic! Leaving the island at the moment is not an option and I wish life was that simple!!! From your listing as being in UK I thought you were just there temporary and lived normally in UK! its interesting to look at the one for Fuerteventura this morning. You can click onto the front page of each graph and this will take you to a 2nd page and you can click again and then it will take you to a 3rd page. Can you explain that one for me longships ? Am interested ? Several years ago whilst in Corrie (beach hotel main St) there was a Plague of large Red locusts millions of them blown over from Africa, the streets ran red all trees and buildings were covered, verandas and if window left open the room was inundated with them. the council worker worked like Trojans and all cleared from town streets in a couple of days! 10 days to go then Caletta Gardens just a week. hope carlos has the beer and glasses chilled (tivoli bar) and El Capitans still has two for ones, never had tapas there even after 12 years coming over promised to this time, if I can work out how to order etc. ( no not language) how ta pas menu works, pay set amount for set dishes or the like ?? It's a Dragonfly, quite a beautiful one too - not nasty and ugly at all. Don't know what species though. You're lucky to have seen it. From the vivid colours I'd say it's a male and if he's a bit tattered he's probably been in combat for breeding rights. When this happens, they sometimes take time out for a breather. 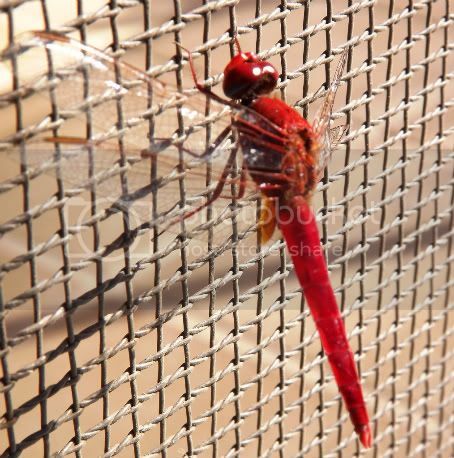 It is called a Scarlet Dragonfly, I think they are beautiful, have a few from time to time in my garden in Caleta.